An isothermal gas-chromatographic (IGC) device has been developed and tested for on-line gas phase studies of volatile oxychlorides of short-lived group-5 transition metals. 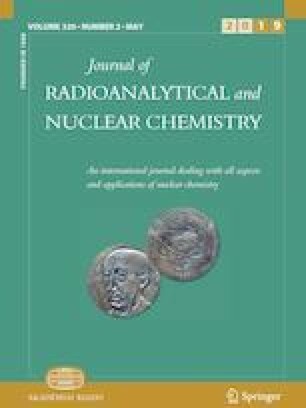 Radioisotopes of niobium and tantalum, produced in nuclear fusion evaporation reactions, are directly flushed into the IGC setup by an inert gas-jet. Oxychloride compounds are formed by the addition of SOCl2 and O2. Parameters influencing the formation and transport of NbOCl3 and TaOCl3 are discussed. For nuclides with half-lives (t1/2) of about 30 s, an overall efficiency of 7% is obtained, rendering the IGC setup suitable for the chemical exploration of 262Db (t1/2 = 34 s). The authors express their gratitude to the crew of the JAEA Tandem accelerator for their assistance in the course of these experiments. The present work was partly supported by JSPS Kakenhi Grant-in-Aid for Young Scientists (B) (Grant No. 20740152).